Once the driver is reinstalled, you should be able to re-enable your firewall settings. Follow the first two steps again, but choose Allow Only Essential Services. At this point, the printer and computer should communicate properly. If you are still having connection issues, you can try adding an exception to the firewall. 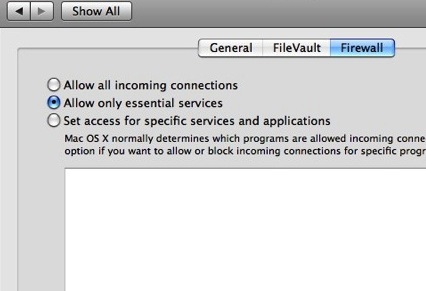 If you already have a firewall running through your router or elsewhere on the network, you can also consider leaving the Mac’s firewall disabled. « Beware Printer Firmware Updates!